If Interim use of Clearview is Rescinded, do you think Canada will follow suit? This question has been bothering me for some time. The MUTCD for Canada currently allows Clearview use in Canada. However if the US MUTCD rescinds Clearview, will Canada's MUTCD follow? Or do you think Canada will keep using Clearview, independent of the US? Many provinces use Clearview, some extensively (like BC). TAC has amended the MUTCD for Canada to allow the use of ClearviewHwy fonts and MTO uses them on their positive contrast guide signs. Re: If Interim use of Clearview is Rescinded, do you think Canada will follow suit? I doubt Clearview will be rescinded in the US. Revised usage, most likely, but not rescinded. FHWA has promised it will be, but so far nothing official has appeared. Iowa DOT has already reverted to Series E Modified of its own accord. As for Canada, I imagine that one or more provinces would eventually follow the US in a Clearview phaseout, but it isn't really any easier to predict the Canadian response than it is to guess the form a US phaseout would take. This is partly because the US federal MUTCD no longer reflects best design practice and thus does not present a compelling model for the Canadian provinces. * In the 2003 MUTCD agencies were given permission to use mixed-case FHWA alphabet series on all guide signs, including conventional-road guide signs. Previously, the MUTCD had shown mixed-case Series E Modified only for expressways and freeways and all-uppercase legend for conventional-road guide signs, but the verbiage allowed the use of mixed-case legend on conventional-road guide signs as long as it was Series E Modified, and this option was extensively exercised in California, Washington, and several other states. Mixed-case versions of the FHWA alphabets other than Series E Modified were also released. Unit legibility information has long been available for all-uppercase Series B, C, D, and E and for mixed-case Series E Modified, but is not (to my knowledge) available in a public source anywhere for the new mixed-case alphabets. Notwithstanding this lack, the 2009 MUTCD now requires agencies to use mixed-case legend for all guide signing, including on conventional roads. * In spite of FHWA's stated intention to rescind the Clearview interim approval, Clearview 5-W and 5-W-R continue to be positioned as head-to-head replacements for Series E Modified. FHWA has alleged that the other Clearview series offer inferior legibility to their FHWA Series counterparts, but since unit legibility data has not been published for the thinner typefaces in either family, it is difficult to verify whether this is true or say how great the legibility gap is. These factors mean that a Canadian province concerned about maximizing legibility of conventional-road guide signs cannot really use a recent edition of the US federal MUTCD (as opposed to, say, the 1988 or Millennium editions) as a starting point. From an engineering point of view, the equivalent guidance in California or Washington state is much better. 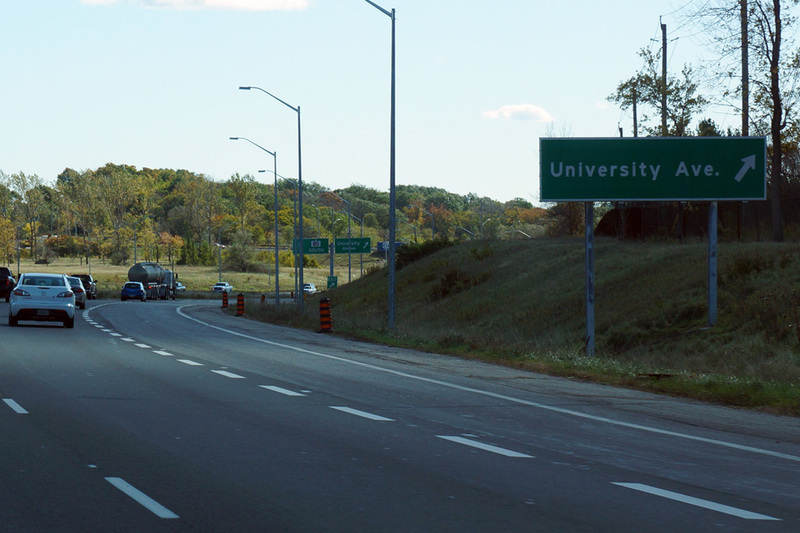 My personal guess is that Clearview will continue to be used in Canadian provinces that use thinner typefaces on conventional-road guide signs and have no history of designing around unit legibility. British Columbia is the classic case in point. Clearview is almost certainly more legible than the BC Font (actually a typeface family) that was previously used, and although BC did use mixed-case versions of the thinner FHWA Series for conventional-road guide signing shortly before its own Clearview conversion, inertia favors continued use of Clearview. Meanwhile, in other Canadian provinces where Series E Modified was previously used everywhere (as in California and Washington), such as Alberta, I would expect reversion to be seriously considered. Clearview 5-W and Clearview 5-W-R are the drop-in substitutes and are pretty equal to Series E Modified in unit legibility, but the issues with the digits would tell, as well as the fact that Clearview is in decline in North America overall even if the rate of abandonment proves to be much slower in Canada than in the US. It is hard to tell how the Big Two--Ontario and Québec--would react. For Québec I would expect reversion to be quite simple since, as far as I am aware, it has used Clearview only for primary destination legend on green-background autoroute guide signs, with the FHWA series continuing as the preferred type family for blue- and brown-background signs as well as green-background conventional-road guide signs. 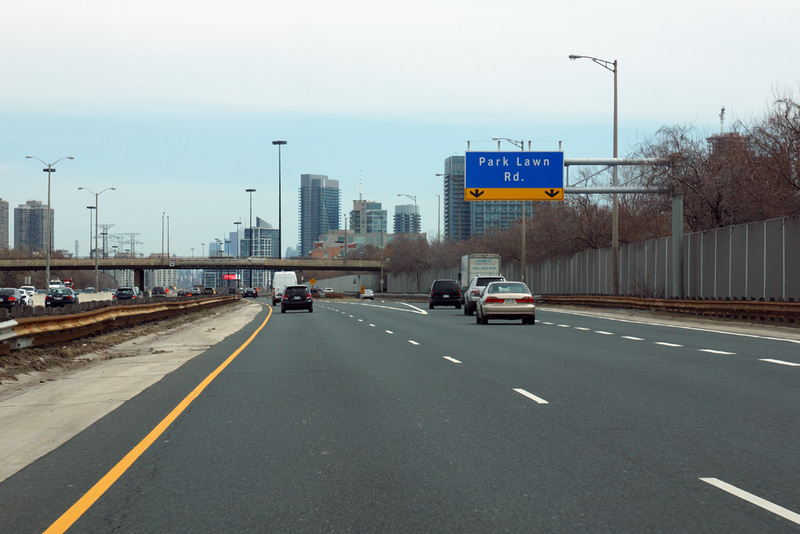 Ontario's Ministry of Transportation has never adopted Clearview. A few signs were erected several years ago as part of a one-off trial period, but that was it, no clearview signs have been erected since. (In fact, several new overhead sign gantries are currently being erected by the MTO where the clearview signage will be replaced once again with FHWA). Some municipalities do use clearview for road signs, notably the city of Toronto, which continues to use clearview on road signs. At least some municipalities are likely to continue using clearview signage even if its use is rescinded in Ontario. The MTO has also switched to mix case signage for a variety of applications where all-caps were formerly used. 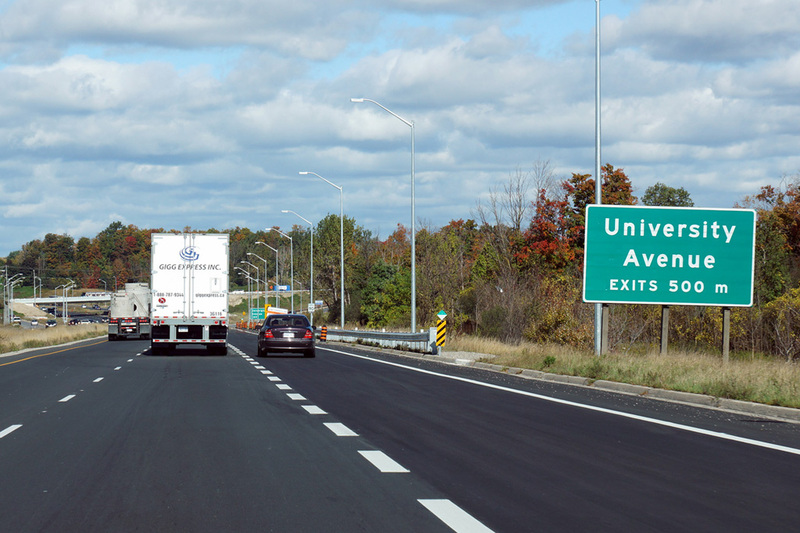 Québec introduced optional Clearview for positive contrast expressway/freeway signage in their MUTCD in 2009 and made it a requirement in January 2012, I believe. I'd be surprised if they ever backed down after that. Yeah. I checked the Quebec MUTCD yesterday (the "Grande Bibliothèque" has a copy of every book in the "Ouvrages routiers" collection, except for part 3 of the MUTCD") and first and foremost: All oversized destination signs with positive contrast MUST switch to Clearview by Dec. 31, 2020. Hmm, I didn't know they had a copy. I should go and have a look. I also wasn't aware of the mandated switch to Clearview by 2021. I guess that means there's a large scale, province-wide sign replacement project coming up. They have a copy of all of what is published under Publications du Québec at Collection Nationale (the secured section, on 2nd floor). You must identify yourself and lock your belongings. No bags nor coats nor jackets allowed. They even have a copy of the 1971 "master numbering plan for the autoroutes". Quite the difference from the small town library I work at, which pretty much treats the stuff that can't be checked out as "bring it anywhere you want in the library; just make sure you put it back where it belongs when you're done." lol. Welcome to Montreal, I suppose. I don't think small town libraries have old, fragile, unique copies, valuable heritage collections and resources for curating it. Nothing to do with the city itself, but much with the invaluable cultural value of the collection. Few nations offer such an eased access to the treasures of its heritage. Moreover, Collection nationale offers on-site archive consultation after retreival from the Rosemont vault at BAnQ's expense (Archives nationales are located in Rosemont, and it's quite a PITA for the common man to get into that bunker ― bring your own white cotton neutral-pH gloves). Unless there was a misunderstanding, I wouldn't expect the latest Ouvrages Routiers - Tome 5 to be stored there. Did not see it was electronic only. You will not find that there indeed, although a paper version would have been available there. You will find a public copy at MTQ Centre de documentation (35, rue de Port-Royal Est, 4e étage, Montréal). There again, on-site consultation only. Most pages of the Ouvrages Routiers are actually older than the last edition. Did you have anything beyond that extract?